Climate Change Policies in Japan / What are COOL BIZ and WARM BIZ? Oki Islands have gorgeous landscapes such as grand cliffs, various sizes of islands, and natural forests of Japanese cedar, while being surrounded by the very clear sea with abundant fish and shellfish. In those Islands, the Geopark project is under way aiming to achieve sustainable local development by making use of their geologically significant local nature and culture for the purposes of conservation, education and tourism. 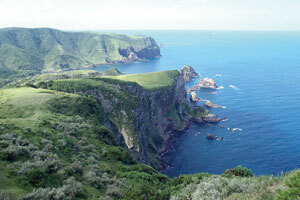 The concept of Geopark is compatible with that of National Parks (i.e. "compatibility of conservation and use"); therefore, in cooperation with the Geopark project, we have set up information signs and provided opportunities of environmental learning in the local areas since 2011. Oki Islands Geopark was added to Grobal Geoparks Network in September 2013, which is thus expected to increase visitors from inside and outside Japan in the future. In this regard, it has been decided that a Ranger Office for Nature Conservation will be newly established in Oki islands in October, and thus rangers for nature conservation of the Ministry of the Environment will for the first time be stationed there. With a view to informing the value of the nature in Oki to the children in the Islands and tourists, I am hoping to create education programs and a framework for human resources development in cooperation with the local people while further strengthening the tie with those involved in the Geopark.